There’s a lot happening in the world of quality management. In order to ensure that you’re always kept up-to-date with the latest developments in this often highly complex field, we would like to invite you to our Quality Excellence Days 2018. The Quality Excellence Days are annual information seminars in which we present the latest trends and innovations from within the field of quality management, discuss fundamental quality management concepts, and show how software solutions can be applied to tackle the quality related challenges encountered in your day-to-day business. 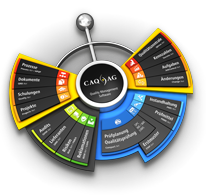 Let us explain to you the often complex ins and outs of contemporary quality management in an easy to understand manner via cutting-edge CAQ software solutions. The seminars each commence at 9:00 and conclude in an open discussion round at approximately 15:00. Food and beverages will be provided. We are looking forward to seeing you at the Quality Excellence Days and trust you will gain invaluable insights from our informative and interesting seminars.